In this post we will be discussing the issue when we bind a collection based (ObservableCollection) property to some scalar DependencyProperty e.g. Text property of a TextBlock. 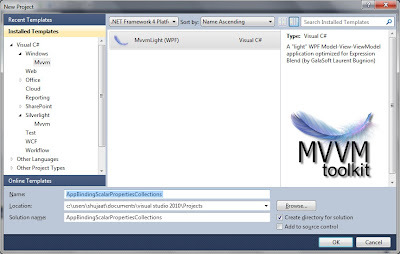 Let's create a sample MVVM Light based WPF application. 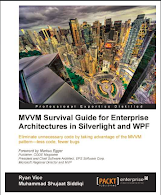 Yes, you would need an installation of MVVM Light in order to follow this example. <Label Content="New Student" Height="23" HorizontalAlignment="Left"
<GroupBox Header="Students List" Height="179" HorizontalAlignment="Left" Margin="6,2,0,0"
<GroupBox Header="Comma Separated Students List" Height="57" HorizontalAlignment="Left"
<Button Content="Add" Grid.Row="1" Height="26" HorizontalAlignment="Left"
for the button's Command property. 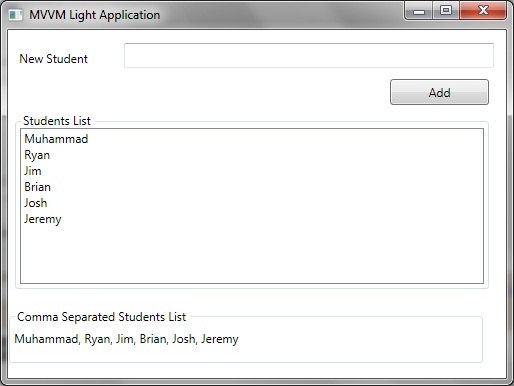 Clicking this button should add the student's name as entered in the TextBox to Student's collection if it already doesn't exist. The ListBox and TextBlock showing this are automatically expected be updated as a new student is added to the collection. 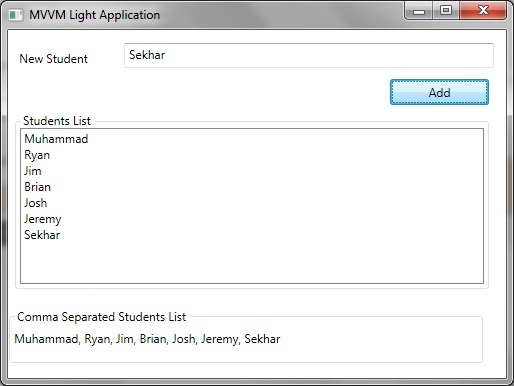 Students collection to be bound to ListBox's ItemSource and TextBlock's Text properties. 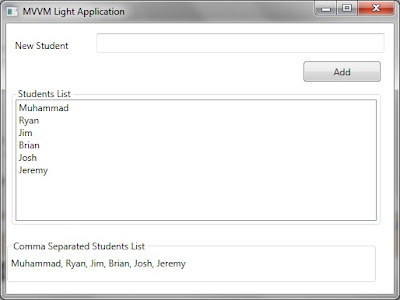 We need the Student's list in the TextBlock to be comma separated names of all students. The view is using a converter for this purpose. It is a simple IValueConverter. Let's see the definition of this converter. In the Convert method of this IValueConverter, we are simple joining the elements of the collection with comma separation and returning it. As we enter new student's name and hit Add button, the new student is added to Students collection. Since this collection is bound to the ItemsSource of the ListBox, it appears in the list box. But the same does not appear in the TextBlock's comma separated list. This is weird!!! Basically, the reason is very simple. When we bind to the Text property of TextBlock, it is just interested in the PropertyChanged events. It handles this event to update its contents. But it seems that it doesn't handle CollectionChanged event of ObservableCollection. That is why it is not able to update itself. Now since we know the problem how we can resolve this. Basically there might be two different solutions to this problem. Here RaisePropertyChanged method raises PropertyChanged event for the name of property provided as argument. This is available due to inheritence of this view model by ViewModelBase from MVVM Light. Let's run the application again. As we entered Sekhar and hit the button, it appears both in the ListBox and TextBlock. This is exactly what we desired. Zindabad!!! In addition of Binding update, we also need to update the converter to IMultiValueConverter. Let's see the definition of StudentListToStringMultiConverter used above. Running the application should have the same result as the first option. Thanks for the tutorial. You have lot of samples there. What is the correct one for this article..? Hi shashikamanoj, You can use multibinding with count property.